No surprise here, but the Jaguars have released kicker Kai Forbath, according to a team announcement. The move was expected after the Jags re-upped Josh Lambo on a four-year, $15.5MM extension. Forbath, was signed in December when Lambo went down with a groin injury. Over the course of a few games, Lambo connected on 4-of-5 field goal tries, including a long of 41 yards. His only miss came from 50+ yards in the team’s Week 17 loss to the Texans. 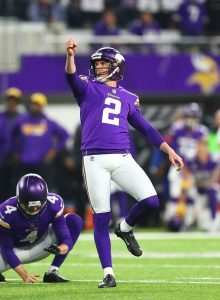 Forbath, 32 in September, spent part of 2016 and all of 2017 with the Vikings, but he was released in August of 2018 after losing the kicking competition to Daniel Carlson. Forbath connected on 88.7% of his field goal tries in Minnesota, but his 84.9% extra point conversion rate left much to be desired. Jaguars have signed free agent kicker Kai Forbath, according to Ian Rapoport of NFL.com (on Twitter). Forbath will serve as insurance for Josh Lambo, who is questionable for Sunday’s game with a groin injury. Forbath has been busy lately. Earlier this week, he auditioned for the Steelers and was asked to stay overnight as the team mulled its options. 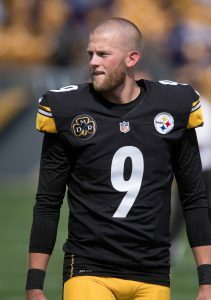 Ultimately, the Steelers decided to stick it out with Chris Boswell, but Forbath quickly found a job after his audition with the Jaguars. 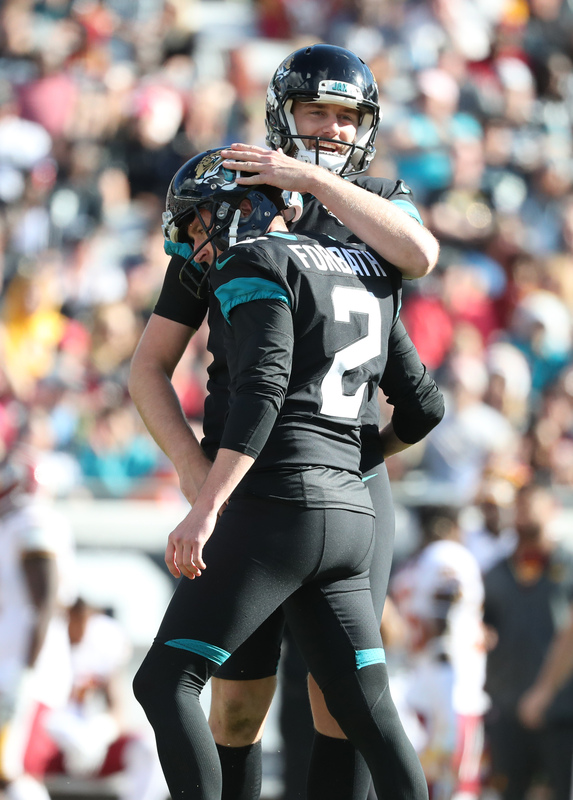 Forbath worked out alongside fellow free agents Caleb Sturgis and Marshall Koehn, according to Rapoport, and had the best showing of the group. Forbath, 31, spent part of 2016 and all of 2017 with the Vikings, but he was released in August after losing the kicking competition to Daniel Carlson. Forbath connected on 88.7% of his field goal tries in Minnesota, but his 84.9% extra point conversion rate left much to be desired. If Lambo isn’t cleared in time, Forbath will have an opportunity to make his first kick of 2018 against the Redskins. Free agent kicker Kai Forbath was impressive during his Wednesday workout with the Steelers, and Pittsburgh is “keeping him on hold” while they determine a course of action with incumbent Chris Boswell, as Jeremy Fowler of ESPN.com tweets. Boswell’s fate with the Steelers could well rest on his performance during Thursday’s practice, per Fowler. Boswell missed two field goals against the Raiders on Sunday, including one that would have tied the game as regulation expired. All told this year, Boswell has missed six field goal attempts (leaving with him a conversion percentage that ranks last in the NFL) and five extra points. According to Football Outsiders’ special teams metrics, the Steelers’ kicking game is the second-worst in the league. Ryan Tannehill‘s injury woes continue, as the Dolphins quarterback suffered an ankle injury in Miami’s stunning victory over the Patriots on Sunday, according to Ian Rapoport of NFL.com (Twitter link). Tannehill practiced on Wednesday and should be able to face the Vikings in Week 15, head coach Adam Gase told reporters, including Chris Tomasson of the Pioneer Press (Twitter link), but Rapoport indicates Tannehill could be limited against Minnesota. Tannehill himself, meanwhile, said he’s “encouraged” by his progress thus far, per Charean Williams of Pro Football Talk. The Dolphins will be fighting for their playoff lives, as FiveThirtyEight.com currently gives them a one-in-five chance of earning a postseason berth. The Ravens appear likely to target safety help early in the 2019 draft, as Jeff Zrebiec of The Athletic writes (subscription required). Eric Weddle could potentially be released next spring if he doesn’t retire, and hanging up the cleats is a possibility for the veteran defensive back giving that he’ll be entering his age-34 campaign. Tony Jefferson won’t be released due to the dead money that would be associated with such a move, but there’s no question Baltimore needs help at safety. As Zrebiec indicates, the Ravens have been horrendous against opposing tight ends, and rank 26th against the position in DVOA. If/when the Jets part ways with Todd Bowles, Gang Green should pursue John Harbaugh as their next head coach, opines Brian Costello of the New York Post. Harbaugh, of course, isn’t nearly the lock to be fired that Bowles is, as Baltimore still has a decent chance of making the postseason, either by winning the AFC North or by securing the No. 6 seed. But if he is available, Harbaugh would add “instant credibility” to a Jets organization that desperately needs it. If Harbaugh doesn’t hit the coaching market, other veterans like Mike McCarthy or Jack Del Rio could be considered by New York, but Costello expects the Jets to target a young offensive mind instead. The Raiders are seeking a new general manager after firing Reggie McKenzie earlier this week, and one name that could surface during the search is Jets director of player personnel Brian Heimerdinger, according to Charles Robinson of Yahoo Sports. However, as Robinson writes, it’s unclear if the Oakland job will have any sort of allure around the NFL, especially given that most executives will see the gig as nothing short of being Jon Gruden‘s “puppet master.” Heimerdinger, for his part, is currently in his third season with New York after previously spending time with the Rams and Texans. The Steelers are giving serious thought to moving on from kicker Chris Boswell. On Wednesday, the club flew in free agent kickers Kai Forbath and Matt McCrane to compete with the incumbent kicker, sources tell Tom Pelissero of NFL.com (on Twitter). Days after Boswell missed two field goals, including a game tying try, against the Raiders, head coach Mike Tomlin admitted that he would consider alternatives. He also noted the general lack of quality options in the free agent pool and he was therefore undecided on whether to audition other kickers. After some consideration, the Steelers opted to open up a competition. Boswell’s miss at the end of Sunday’s game can be attributed to the bad turf in Oakland, but the rest of his struggles this year cannot be written off. Of course, this comes just months after the Steelers gave him a four-year, $19.2MM extension with a $6MM roster bonus, which may complicate the final decision. The division-leading Steelers finish out the year against the Patriots, Saints, and Bengals. Thanks to a three-game losing streak, they lead the Ravens by just 0.5 games for the AFC North crown. Dustin Hopkins‘ availability for Week 11 appears to be in question, so the Redskins are getting an early start on examining replacement help. With Hopkins “a bit banged up,” per Field Yates of ESPN.com (Twitter links), Washington brought in several kickers for a Tuesday workout. Blair Walsh, Roberto Aguayo, Kai Forbath, Sam Ficken and Jon Brown participated, Yates reports. Of the quintet, only Ficken has kicked in a 2018 game. Walsh and Forbath had gigs last season, with the Seahawks and Vikings, respectively, while Aguayo has not kicked in a game since his rough 2016 season. Forbath has a history with Washington, having been Hopkins’ predecessor. 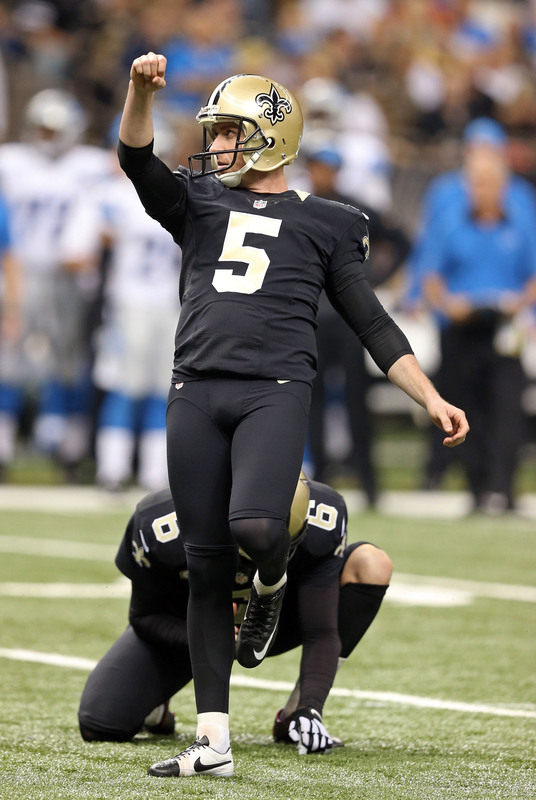 The UCLA product served as the Redskins’ kicker from 2012-14 before moving on to roles with the Saints and Vikings. The latter cut him this year, giving the job to rookie Daniel Carlson, whose grip on it lasted two games. The Redskins went through this with Hopkins last season. He missed eight games in 2017, and Washington used Nick Rose as its kicker during that time. Rose is not believed to have been among today’s tryout contingent. Also perhaps soon to be available is Chandler Catanzaro, whom the Buccaneers sent to waivers on Monday. But his two misses Sunday helped the Redskins pick up a road win. Kai Forbath, Cairo Santos, and Taylor Bertolet are among the kickers working out for the Colts on Tuesday, sources tell Mike Garafolo of NFL.com (on Twitter). One of these players may wind up filling in for Adam Vinatieri as he recovers from a groin issue. Vinatieri’s status for Sunday’s game is murky, so the Colts want to have a kicker at the ready in case he is unable to suit up. After Vinatieri missed two extra point tries against the Bills – something he hadn’t done before in his 23-year career – the Colts probably don’t want to trot him out there if he’s still hurt. Forbath and Santos offer extensive NFL experience, while the 25-year-old Bertolet is still waiting for his first kick in a real NFL game. The Rams are releasing kicker Sam Ficken and intend to sign another veteran to kick until Greg Zuerlein is recovered from his groin injury, a source tells Adam Schefter of ESPN.com (on Twitter). The kicker auditions will include veterans Cairo Santos and Kai Forbath, Mike Garafolo of NFL.com tweets. Ficken, 25, took over for an injured Zuerlein at the tail end of the 2017 regular season and called upon to do the same thing this year. Unfortunately, he’s struggled in his two games, making just one of three field goal tries. The Rams are 4-0, but missed field goals could obviously cost them down the line. Santos has historically been a solid kicker, but he’s dealt with a nagging groin injury for more than a year. Forbath, meanwhile, was released by the Vikings in August losing out to rookie Daniel Carlson. In 2017, Forbath converted 32-of-38 field goal attempts (including six-of-nine from 50+ yards), and his 84.2 accuracy percentage ranked 16th in the NFL.